Nigerianflightdeck.com learnt that Ms. Olabode one of the racketeers stole the funds by using the names of deceased or retired staff of the agency to draw funds from the agency’s accounts. FAAN in a reaction to this has confirmed there was theft in the agency and has suspended the staff involved in the alleged diversion of funds along with those indicted. The agency in a statement to our medium stated that upon discovery, the management set up a committee, which investigated the major suspect who promptly named others involved in the fraud and they were swiftly suspended. Our team found out that some banks involved in the illicit deposits were Fidelity Bank, First City Monument Bank and First Bank. Documents in possession of Nigerianflightdeck.com show some of the names Ms. Olabode used to divert funds. In December of the same year, a deposit of N2,719,699.92 was made into an account number, 0059963039, in the name of Bright E. Ogbonna at Access Bank. In August 2013, the sum of N2,719,699.92 was lodged into an Eco Bank account, 2501016701, bearing the name of Paul Amaechi Ihedinihu, a GL 14 officer. Ms. Olabode also funneled N2,184,168.96 into a Diamond Bank account, 0031963629, in the name of Adamu Sanusi and N2,719,699.92 was deposited in the name of Yahyah A. Sadiq in a Guaranty Trust Bank 0035237900; N1,493,903.52 into another Guaranty Trust Bank account, 0113269817, in the name of Yunus Olaniyan Agboola. The lady also used names like Habibu Abubakar Adamu, Isaac Joel Okwodu, Blessing Inye Pepple, Nnamdi T. Onuchukwu, Hurso Muhammed Hurso and a host of others. Ms. Olabode’s husband is also a staff of the human resources department at FAAN. FAAN in its statement said it was when the committee drilled the main suspect who confessed that some of the monies were sent to her brother’s accounts that prompted the management to further invite more suspects who were subsequently suspended. The Economic and Financial Crimes Commission (EFCC) operatives who got wind of the matter decided to investigate it and have detained the prime suspects. FAAN said after the audit it would further modernize its accounting system, explore new ways to boost revenues and also to continuously monitor activities of its personnel involved in revenue generation and accounting. It expressed the hope that EFCC would unravel the details of the fraud, punish those involved and also work with management to forestall such from happening again. 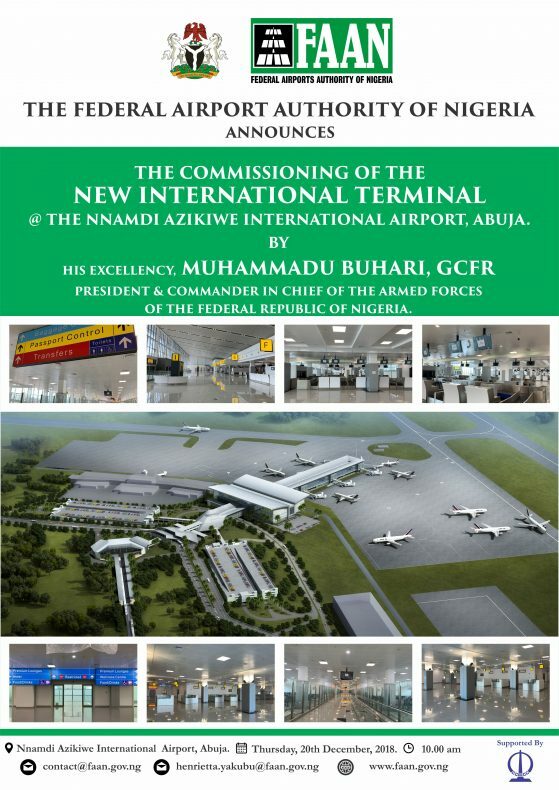 The agency said it is laden with huge responsibility to effectively manage the airports, fund the rehabilitation of many airport terminals and also complete on going work at some of the airport facilities under construction, so it needs more funds to effectively manage the airports. 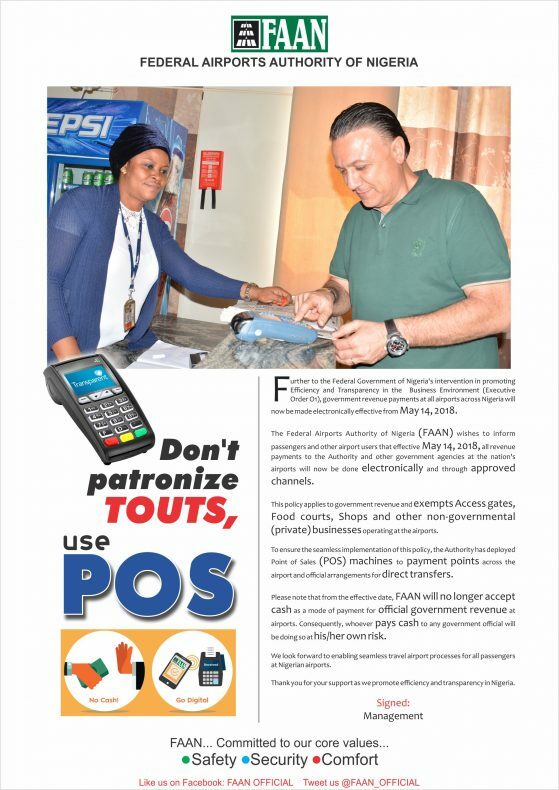 After the audit FAAN said it would adopt a policy of rotating its personnel in the accounts and commercial departments every two years so that no person would stay in one unit for more than that period of time, noting that people think of perpetrating fraud and all kinds of malfeasance when they stay too long in one post.